There is a growing sentiment in Europe and North America that governments should “ban the burqa”. Usually, what they are referring to is a ban of the niqab: a face covering used by some Islamic women. There are certainly times at which the administration of justice or government requires that a person’s face be visually identified. For example, a recent Court of Appeal decision in Ontario notwithstanding, my view is that it is never any more right for a female witness to wear a religious face covering on the stand than it is for a biker to wear his headscarf on his face while giving testimony on the stand. Government-issued photo identification ought to make no exceptions: no face coverings, period, because the purpose of such identification is to ensure that the right person is identified properly with respect to compliance with our laws. We must ensure that we all can visually identify the faces of the government employees who serve us. Private property extends the same rule-making powers to the property holder. Consequently, one should be free to set the terms pursuant to which any person enters onto or uses ones own private property: if I require you to wear lederhosen before stepping into the brewhouse I own, your choices are (a) wear lederhosen, or (b) stay out of my brew house. However, there is at least one argument in favour of the ‘burqa ban’ that I find wholly indefensible: the argument that we must ban the burqa so that women can be freed of the oppression it represents or causes. Consider the bikini. Thousands of women take to the beaches every summer. Many enjoy wearing shorts and a tee shirt or a bathing suit that provides generous body coverage, and many decide against wearing a bikini. One might rightly argue that religion – or fashion magazines featuring unusually modelesque women in bikinis – impose upon women psychological or social pressure to cover up when on the beach; pressure not to wear a bikini. However, in a free society, it does not follow that we must therefore ban the wearing – by women, on beaches – of shorts, tee-shirts, or bathing suits that provide generous bodily coverage. If a woman wants to wear a parka and snow pants on the beaches of Florida in the summer, no law should prohibit her from doing so. 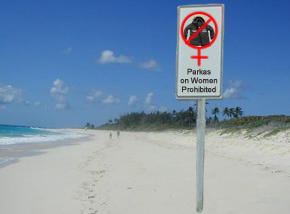 It does not matter whether the woman’s religion requires her to wear a parka on the beach. She is free to abandon her religion (and she should have the guns of the state to defend her life, liberty, and property from anyone who would try to harm her for leaving her religion). It does not matter whether photos in Prettier Women Than You Magazine make her want to cover up: magazines are not violations of her life, liberty, or property. Besides, her self-esteem is not something that will be improved by persuading her not to use the beach, or by persuading her into wearing a bikini on the beach even if it makes her feel nothing but shame and embarrassment. It does not matter that, by wearing a parka on the beach, young girls might be encouraged – or psychologically pressured – similarly to bundle up and join the superstitious, self-loathing, oppressive, collectivist parka cult. None of us are morally obliged to be someone else’s allegedly-good role model, in a free society. The female oppression argument in favour of banning the burqa or niqab is every bit as irrelevant and silly as the oppression argument in favour of banning the wearing of parkas at the beach. As I say above, there are legitimate reasons for the state – or the private property owner – to require the removal of facial coverings. Defending a woman from the responsibility of having to decide whether or not voluntarily to submit to the dictates of a religion is not a reason that has any merit in a free society.